This was the second time I had Baird Bureiko Jikan Strong Golden Ale as I had a quick “pint” of it at the Bashamichi Taproom after visiting a few bars for review purposes. At 9% though, it’s right up at the strong end of beers and promptly sent me spinning which then ended up with me buying some bottles of it for “review” purposes. Baird Bureiko Jikan Strong Golden Ale is not for the weak-willed or those with delicate palates. It poured out a very hazy brown colour with a fluffy-head off white head that clung to the side of the glass. The aroma was not as sweet as other Belgian strong ales I’ve had in the past but then it is brewed with more of an American influence, though the honey and smoke aroma were good. It was a fairly boozy aroma. 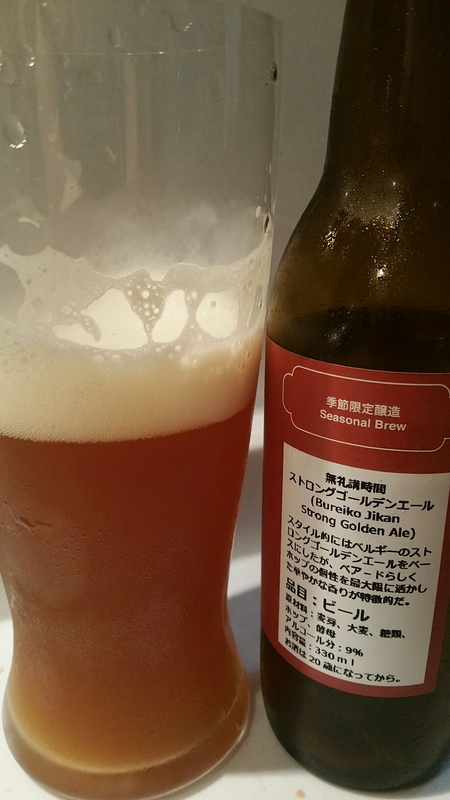 Baird Bureiko Jikan Strong Golden Ale had a thick, strong taste of peaches and candied fruit to it. There was a little bit of hoppy bitterness in the aftertaste but the alcohol was hidden very well. And there was alcohol in there as about 30 minutes later, my head became woozy and dizzy. Baird Bureiko Jikan Strong Golden Ale is a potent beer that is a good example of a Belgian strong ale though needs a bit of refining. Baird Bureiko Jikan Strong Golden Ale is on sale from the end of April across all Taprooms. I got my bottle from the Bashamichi Taproom.